There's no need one to be an eager fan of tourism or the nature to feel the energy and atmosphere when hiking between the peaks Big and Small Bears. That's where you will find the amazing Macedonia Hut! Even though that the Macedonia Hut is one of the highest based huts in Bulgaria and in the Balkan Peninsula, you will be surprised that there mobile coverage! One of the ways to get to the hut is from Blagoevgrad city to Bodrost Hut and then walk for about 2.45 hours on a marked trail. From Bodrost region you can catch the cabin lift "Kartala" to peak Ravnetz which will take you about 3 hours. From Semkovo it will take you about 2 and a half hours. From Dobyrsko village - around 4.30 hours. The Macedonia Hut first opened doors in 1937! It was first named after the region's name - Ajgidik. The word comes from Turkish and it means Bear's passage. On September 9, 1945 the hut's name was changed to Stanoi Krekmanski who was member of the guerrilla squad of the region. The region is extremely beautiful and it's great for hiking and hanging out with friends and your family. If you are a fan of huts and mountains, that's the place to be! Gorski Rai Hut is one of the first private huts in Bulgaria. It is located in North-Western in the Balkan Mountains, under Mount Midzhur and on boundary of the biosphere reserve "Chuprene." This is not the standard hut through which pass dozens of tourists coming from neighboring chalets. It is quite remote from other ones and still attracts many people. And as owners told me "once you’ve seen the place, you definitely want to return." I went there with a desire to understand what magic attracts tourists to this hidden corner. Although the hut can be reached by car, I wanted to walk to there. The eco trail starting from the area "Bekinska shoburka" a few kilometers above the village Chuprene leading to the ridge of Balkan Mountains, where it merges with the tourist trail to the peak Midzhur. Steep and overgrown, covered with blackberries and wild flowers. Аfter 1000 meters elevation difference just before the hut the vegetation overflows into pine forest and you can feel the amazing smell of pine trees and resin. When we imagine high mountain hut, our first association immediately evokes a feeling of warmth and comfort burning fireplace, delicious food and a clean bed. In reality, these huts are not much our mountains. We did a tour which starts from the Balkan Mountains to Pirin Mountains to take a closer look at the management of three prosperous high mountain huts, all private or leased for a long period of time. 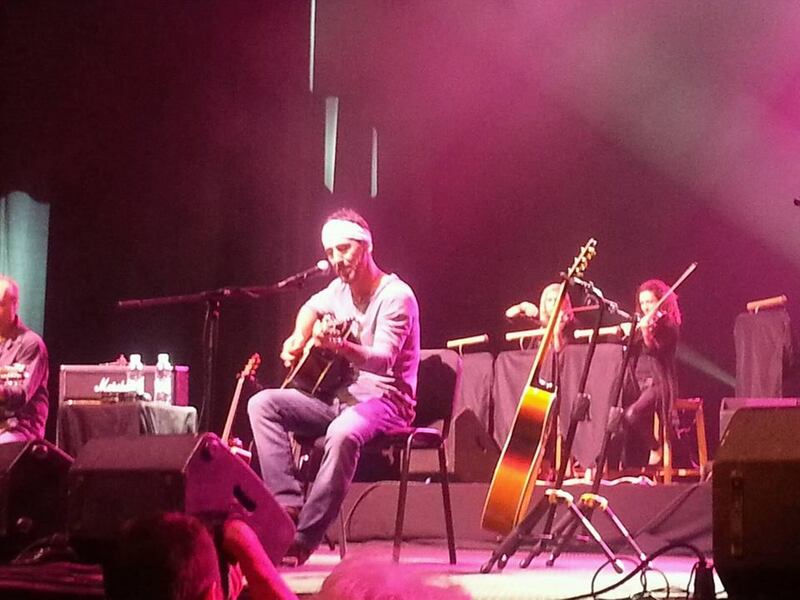 Due to the big interest from his fans in Bulgaria and quickly sold out tickets, the magnificent artist Sully Erna had 2 concerts last night at the National Palace of Culture in Sofia. The few of the team members of Visit Bulgaria Today had the great opportunity to see the first one which started at 5 pm and ended at 6:45 pm. Salvatore Paul "Sully" Erna was born on February 7, 1968 in Lawrence, Massachusetts. Sully Erna is the vocalist and guitarist for the American hard rock band Godsmack. He is also a harmonica player, percussionist and pianist, performing these on albums and at live shows. He was ranked 47th in the Top 100 Heavy Metal Vocalists by Hit Parader. The tickets for the initial concert(started at 8 pm yesterday) were sold out so quickly, so Sully Erna decided to has a second concert(started from 5 pm) and the tickets for the second concert were sold out in matter of hours.These concerts were also his first performance outside of the United States for his new tour around the world tour. Our crew went to the concert at 5 pm and we were extremely excited about Sully Erna's performance. It was awesome to see him playing The Metallica's song - Nothing Else Matters, 2 songs from Godsmack, few songs from Avalon, and also few songs from his new album Hometown Life. He also had few solo performances playing on a piano. Our team also went to club Terminal 1 bar for the official after party. We had so much fun and we will keep you posted for any coming concerts and music festivals happening in Sofia city and in Bulgaria. http://www.visitbulgaria.today - VisitBulgaria.Today is a free informational source to help foreigners visiting Bulgaria with information, articles, and current events about Bulgaria. Veliko Tarnovo is a city in north central Bulgaria and the administrative centre of Veliko Tarnovo Province. Often referred to as the "City of the Tsars", Veliko Tarnovo is located on the Yantra River and is famously known as the historical capital of the Second Bulgarian Empire, attracting many tourists with its unique architecture. The old part of the city is situated on the three hills Tsarevets, Trapezitsa, and Sveta Gora, rising amidst the meanders of the Yantra. On Tsarevets are the palaces of the Bulgarian emperors and the Patriarchate, the Patriarchal Cathedral, and also a number of administrative and residential edifices surrounded by thick walls. Trapezitsa is known for its many churches and as the former main residence of the nobility. During the Middle Ages, the city was among the main European centres of culture and gave its name to the architecture of the Tarnovo Artistic School, painting of the Tarnovo Artistic School, and to literature. Bachkovo monastery is the second largest monastery in Bulgaria. It is beautifully situated on a ledge, on the right from the Valley of Chepelarska River, close to the village of Bachkovo, 10 km from Asenovgrad and 30 km from Plovdiv. Bachkovo monastery is the second most visited monastery in the Bulgaria. During the weekends or on orthodox holidays, there are large groups of pilgrims and tourists. The climate is mild because Bachkovo monastery is in the heart of the Rhodope Mountains. The summers are breezy and the winters are mild. Therefore, most vegetables and fruits could be successfully grown in the valley yards. The Bachkovo monastery is almost 8000 sq.m and about 440 meters above sea level. It includes two yards and 4 churches. The monastery has 18 chapels, 10 in Asenovgrad and 8 in its surroundings. Close by is the the National reservation park “The Red Wall”. It is famous for its fauna which includes quite a few rare animals and the plant Haberlea Rhodopensis, a prehistoric in nature, whose sky blue flowers enchant the visitors every spring. Near by is the Chepelarska river named by the locals as ‘Chaja’. Chaja has been the monastery trout fish supplier for a long time. Keen fishermen patiently wait on the shores with hopes to get lucky. For those willing to try the fish without catching it yourself, it is served in most restaurants in the village. Visitors could stay at the monastery or at the many hotels and houses that are close by. The monastery is part of the Bulgarian Heritage. It is open to visitors at all times.